Thirty years ago the Nitty Gritty Dirt Band had the nerve to ask their hero Earl Scruggs if he'd play with them. He said yes, and with him aboard, they asked their other heroes: Roy Acuff and Doc Watson. Both said yes, too. The next step was to get the budget to record their album. United Artists President Mike Stewart wasn't sure the album would sell one copy, but seeing as how the Nitty Gritty Dirt Band was so gung ho about the album, he approved them for a budget of $22,000. 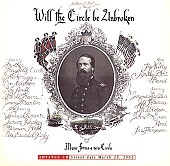 Will the Circle Be Unbroken was born and thirty years later stands as a classic country/bluegrass that has influenced many artists worldwide. A two-disc set of some of the best country you're likely to hear, Nitty Gritty Dirt Band and friends take on the country songs that made country, playing it with pride, lively and soulful, from the warm bluegrass soaked harmonies to the gritty, country stomp. Two previously unreleased songs - "Foggy Mountain Breakdown" and "Remember Me" - help make this 42-track album, re-mastered for its thirty year anniversary, a gem in its own right, a must own for country and bluegrass fans alike. I'll give it an A+.